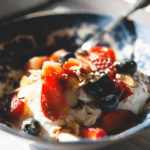 Before the Instant Pot® made yogurt-making for me even easier, here’s the method that worked best for me in my kitchen. No fancy gadgets or ingredients . . . other than the Kleynhuis Strainer Pouch of course. 🙂 Just you and milk making magic happen in your warm and cozy oven. Here’s a one-sheet summary of both my stove-top and Instant Pot Greek Yogurt-Making Methods. Before getting my Instant Pot, here are the steps I used to make Greek yogurt using my stove and oven. Slowly heat milk to 195°F. Heat 1 gallon of milk in a covered pot on medium heat until it reaches 195°F. Maintain temperature for 10 minutes. Depending on the type of stove and pot you are using, this will take approximately 30 minutes. Be careful: milk will boil over at 212°F. Note: You may be tempted to skip this step since you will most likely be using milk that is already pasteurized. 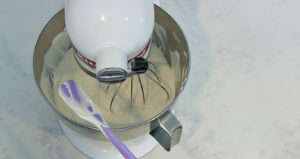 But heating the milk denatures the whey protein, resulting in improved consistency. Cool milk to 115°F. 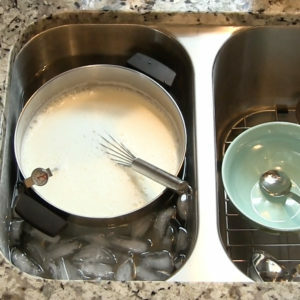 After milk has finished heating, take the pot off the stove and place in a sink filled with cold water and ice. Cool milk to 115°F. which will take about 15 minutes. 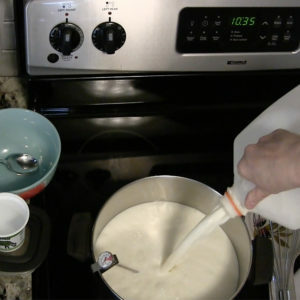 Skim off any skin that forms on the top of the milk. Warm up oven. While milk is cooling, turn on oven to 350° for 3-5 minutes, then turn off the oven and turn on the oven light. The goal is to bring the oven temperature to a warm temperature between 105° – 115°F. This may take some trial and error, and note that yogurt cultures will die at temperatures above 130°F. Incubate at 105-115°F. for 8-10 hours. Place the lid on the pot and wrap in a large towel. Place in a warm oven (105–115°F.) with oven light on. Don’t disturb for 8–10 hours. 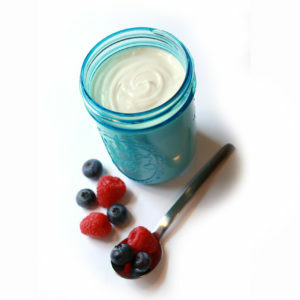 The little yogurt bacteria will begin working their magic of turning milk into yogurt! It works great to start the batch in the morning and allow it to incubate all day, or make it at night and incubate over night. 2) wrap pot in a towel and place on a heating pad set to low.